We checked in with Vivienne Tang, founder of wellness and travel online publication Destination Deluxe. She is a key influencer in the travel and wellness field, having spent 17 years working in lifestyle and fashion publishing houses and reputable lifestyle magazines. WHEN DID YOU START YOUR WELLNESS JOURNEY AND WHY? I received my first reiki session 25 years ago. It marked the beginning of a long wellness journey. Since then I’ve launched a holistic wellness centre and set up Destination Deluxe, a wellness & travel publication and booking platform, where we hand-pick the finest luxury resorts and hotels, the most sought-after destinations, retreats and spas from around the world. TAKE US THROUGH YOUR DAILY FITNESS ROUTINE. Because I travel so much and barely have time to make it to the gym and fitness classes, I’ve started a regular HIIT workout routine at home, which I can also do in any hotel. I also bring my power band wherever I go. When I’m in Hong Kong and feel particularly social, I love taking barre classes and spin sessions at XYZ. I meditate on a regular basis. So I normally keep my Zen time and my fitness workouts separate. Therefore, my recent Breathe Ride at XYZ was very interesting, as I normally wouldn’t combine the two. I thought it was really cool to take a fitness class and incorporate breathing to take myself to a deeper place within, and to give the workout another dimension. I love breath work! There is so much potential transformation that can take place with the help of breathing methods. HOW DO YOU JUGGLE WORKING OUT AND WORKING IN HONG KONG? Because I’m as time-starved as everyone else in this super hectic city, I often work out at home now as mentioned above. But I do love the social component of XYZ and other yoga and barre classes that I take. Sometimes I feel they’ve replaced a night out with friends. Instead of drinking, we work out now! ON TRYING OUR NEWEST CLASS TYPE - BREATHE. WHAT DID YOU EXPECT COMING INTO THE BREATHE RIDE AND HOW DID YOU FEEL AFTER IT? To be honest, I wasn’t sure what to expect. But I loved the ambience of the candle light, and I thought the voice of the instructor was really soothing. After the class, I felt great. The class really felt like an inward journey. I think it can be very transformational if done on a regular basis. 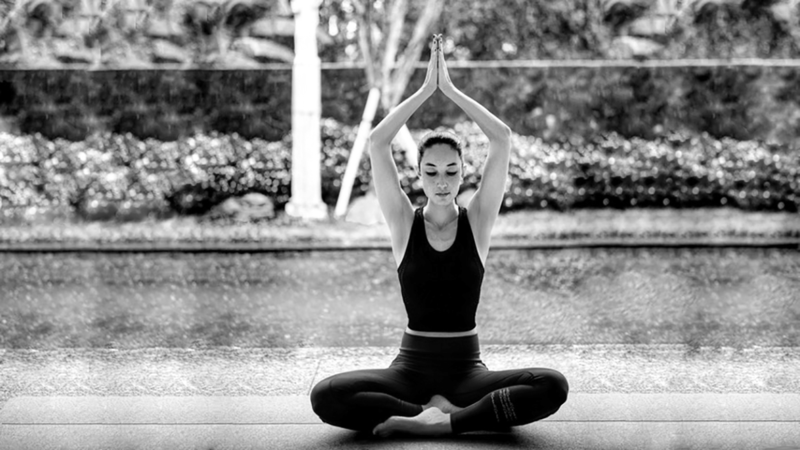 HOW DO YOU ENTER INTO A ZEN STATE OF MIND BEFORE TAKING A FITNESS CLASS? Just the thought of it being a deeper practice already puts you in the right frame of mind. It’s no longer just a sweat session, but a personal journey. “Stuff” (thoughts, challenges, issues, etc) will come up during the ride, and you stay with it. You simply breathe through it. It’s such a simple technique, yet so powerful. WHAT IS YOUR NUMBER 1 WELLNESS TIP? Meditate. If done on a regular basis, it will transform your life in a magical way. To improve any kind of relationship, you have to improve the relationship with yourself. Meditation is the best tool to get to know yourself better and heal any imbalances you will come across in your daily life.